12 April 2010, at 10:56a.m. 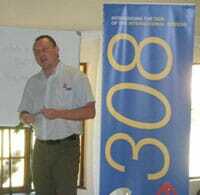 SOUTH AFRICA - Following the launch of the International Ross 308 in South Africa in 2009, Aviagen and the local distributor Ross Poultry Breeders (Pty) Ltd (RPB), organised a series of road shows as part of the ongoing support for Ross customers. In total eight events took place over the week of 15 March, with around 300 delegates attending. Michael Longley said: “The broiler road shows were well attended and excellently received by RPB customers across the country. They are an essential part of ensuring International 308 Ross Broilers are a success within South Africa and an ideal platform to show our customers we are here to support them and make Ross the breed of choice in South Africa.